Looking for bathroom paint colors handed to you on a silver platter? In a sense, that describes this gallery of paint color ideas, fully arranged by professional designers, and copy-able by you for instant designs. Even homeowners who know nothing about how to coordinate colors can execute these schemes. Behr, a respected manufacturer of wallet-friendly paints (sold at The Home Depot), calls this bathroom scene Wistful Washroom. This is a paint scheme that is bold and friendly, with a two-tone wall design that makes the clawfoot tub pop out, and creamy off-white baseboards for a classic, antique look. Benjamin Moore describes these colors as having a feeling of "serenity and tranquility" (their term: Spa Retreat). If your taste runs toward warm accents, this cool paint scheme provides the ideal background. Note that these fall in the neutral color category. Some clever person needs to invent a new name for neutrals because this is misleading. From from being wishy-washy and character-less, neutrals either fall into warm or cool categories. From there, each category gets broken up even further. In this pictured room, you are looking at cool neutrals with a slightly bluish tint. Call it a mountain cabin look. Call it lodge-y. But this color scheme comes to you straight from a partnership of Valspar and Eddie Bauer, the clothing retailer. The wall color (Burnt Brick, EB37-4) is a strong, masculine contrast to the cooler trim color found on the wainscot (Vanilla Bean, EB25-3). Almost every element is completely DIY-able: the two sconces from Rejuvenation Hardware on either side of the mirror; the wainscot, which can be installed with the help of a brad nailer; the floor, which isn't shown, might likely be a wood-look ceramic floor, impervious to moisture from the clawfoot tub. Super-Blue Bathroom Paint Colors - Just for Kids? Oceanic, but whimsical. This duck-themed color scheme hearkens back to days of playing on the seashore as a kid. But why stop at the kids' bathroom? This is a bold and unexpected arrangement of blue, bluer, and bluest colors that Valspar groups in its Unexpected Colors category. Note how easy it is to coordinate other elements of the bathroom with the same color. Take a look at that step stool. It's a simple thing to dab some of the wall paint on the stool (clean it off first, though) after doing the walls. For added whimsy, paint window and door trim. So, live a little...and turn that traditional white trim into something that catches the eye! A sophisticated way to easily add style to your powder room--or any kind of bathroom. These colors maintain a rich warmth but still remain on this side of dignified. It's a soft yellow that helps to brighten the day, but without hitting you over the head with a glare. I call it a yellow-for-people-who-don't-like-yellow. The beadboard wainscot is--as usual--painted white. That's the easiest, safest route. But if you are looking for something bolder and less typical, you can paint your wainscot colors other than white. Dark-brown or a dark natural wood wainscot would go well with this yellow wall color. From Dutch Boy, a highly reputable maker of paints that has been around for over 100 years. Looking for colors that evoke summers and lemonade at the beach all year 'round--even into the dark months of winter? This is it. From Valspar, a soft summer seaside look that works wherever you happen to be--city, country, or gosh, even seaside. This paint color can go in many different directions: whimsical enough to work for a kid's bathroom, cheerful enough for a guest bathroom. And because this design has none of the overly cheerful and oppressive qualities that "nautical" themes happen to have, you will enjoy it day in and day out in your own bathroom. Green is hard. Get the hue wrong and you end up with a green reminiscent of a primeval forest, and equally murky, dark, and foreboding. So this design combines no less than two different shades of green from Valspar (Salamander and Beach Grass) with two neutrals (Lyndhurst Shady Grove and Green Monsoon). This complexity gives your bathroom a playful feeling that is anything but dark and heavy. With this type of green, the only acceptable trim color is crisp white. Once again, as noted earlier, it's always a great idea to paint additional bathroom features while you've still got the paint can open and the brush wet. Here, the cast-iron bathtub has been previously sanded down and thoroughly clean, and then painted in matching colors. Have you ever seen a bathroom color design with more punch than this? From Dutch Boy is a Crayola-branded orange called Sunglow up against Turquoise on the cabinets. If you are not feeling particularly brave and sure of your artistic skills, you could also paint in the frogs and lily pads in Granny Smith green. Even without the frogs, it is safe to say that this is best suited for a kid's bathroom. Feeling a little stirred up? Agitated? Anxious? These colors from Dutch Boy, by contrast, are easy and simple. Begin with one soft field color, Comforting Peach, that dominates the room...but in a gently dominating way, not a bold "Georgia Peach" type. Then the crisp fresh lines of the Dutch Boy white you can use for almost every occasion--Ultra White C4-4 (memorize that, will you?). Both are solid bathroom paint colors you can depend on, both of which work well in small bathrooms, too. Wine and Coffee in Your Bathroom? This is a relaxed rose from Behr called Mulled Wine with a dimmed-down white, Swiss Coffee. This is a red that really brings in the light and captures it. This color would look fantastic painted on the lower section of that cast-iron tub. Two views of a nice bathroom paint color scheme from Sherwin-Williams: mountain-sky blue and cumulus white. Note how the color scheme is bifurcated. From the top of the wainscot downward, everything is white. Everything above is blue. This bathroom's colors are yellows, blues, and grays. But because the paint manufacturer has toned down and smoothed off the rough edges, these colors work great for any bathroom where rest and relaxation are of prime concern. This idea from Olympic Paint and Stain lets you cut loose from reality and get lost in a book or music while luxuriating in the bathtub. Horizontal trim separates the top of the wall from the lower wall, giving the illusion of wainscot. 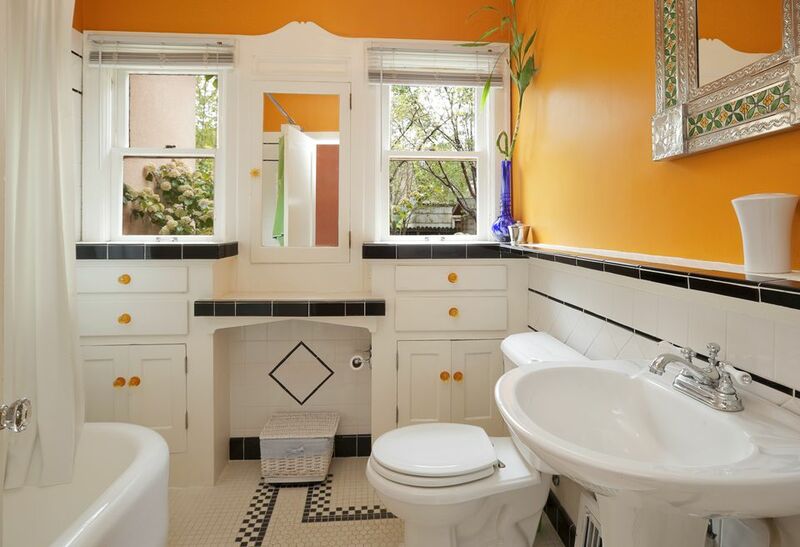 To say the least, these are not shy bathroom paint colors. Ralph Lauren Home has produced some strong tones for bathrooms. The strongest of the bunch, Light Orchid, on the left-hand wall, succeeds because you're only splashing one wall with it. Call it an accent wall if you like, but it helps liven up the most neutral shades on the window-side wall and adjacent trim. Who said that wainscot has to be white? From Ralph Lauren Home, this wainscot takes on a rich yellow tone and is coordinated with the French Pink walls. And because any traditional bathroom (albeit painted in non-traditional hues) needs a touch of the conventional, you'll be pleased to note that the trim is good old white--Picket Fence White, even. Bathroom paint color theory doesn't usually take marble into account. This is a shame since marble is so prevalent in many bathrooms. Here Ralph Lauren Home's Wisteria complements the beauty of these faux-marble walls. This color from Devoe is simple. It's pure white on the wainscot and a deep red with slight orange tones on the walls. This color gives the bathroom a stately, regal feeling: a place where the bather can relax in the tub for hours on end--queen or king of one's own domain. Drawing from Devoe Paints' Blue/Green color range, we find two crisp colors that evoke the feeling of a summer at the shore. Both are vibrant enough that the feeling can carry through all four seasons, whatever your location. Benjamin Moore teamed up with Pottery Barn to offer homeowners a smart selection of themed paint colors for the bathroom, and all parts of the house. Here we find a handsome light-tan called Weimeraner AF-155 on the backsplash behind the sinks. This color very much takes into account the attractive wood base cabinets, complementing rather than competing with them. A bathroom paint color to soothe the nerves and fill the soul--Constellation AF-40 by Benjamin Moore, from its Pottery Barn Collection. The paint color is on the lighter end of the blue-green color range and works well in powder rooms, guest bathrooms, and kids' baths, too. Neutral paint colors are maligned as dull and uninteresting. In fact, this is often the case. But this swirly, stormy, foreboding bathroom paint color is a very strong neutral--Storm AF-700, it's called--and it won't take the assignation "neutral" lying down. From Benjamin Moore's Pottery Barn Collection.